Calling a constructor from the another constructor of same class is known as Constructor chaining. The real purpose of Constructor Chaining is that you can pass parameters through a bunch of different constructors, but only have the initialization done in a single place. This allows you to maintain your initializations from a single location, while providing multiple constructors to the user. If we don’t chain, and two different constructors require a specific parameter, you will have to initialize that parameter twice, and when the initialization changes, you’ll have to change it in every constructor, instead of just the one. In this example, I have several constructors, one constructor is calling another constructor using this keyword. 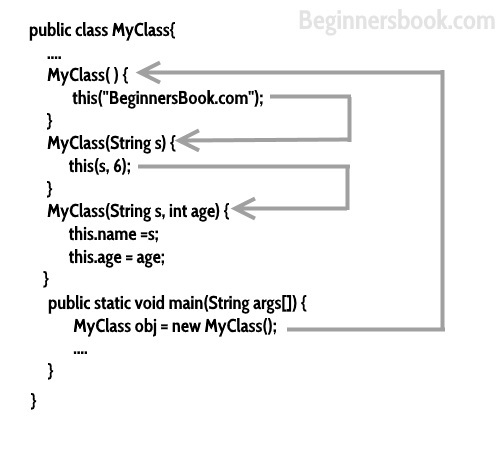 OOPs concepts – What is Aggregation in java? But what is the point of constructor chaining? i.e. why would I ever want to do this? Eg: for a lift to be programmed you’ll need to type the code for the things to be done in the 1st floor even when you have to go to the 2nd or 3rd floor you can just call the constructor chaining to skip the code of 1st floor when the 3rd floor button is pressed. Thanks so much ! Now I easily understood the concept of Constructor chaining. Thanks Author ! In the above scenario how many objects gets created in heap, since constructors are using for creating an object. But here you are using constructor chaining to call 4 constructors at a time by passing 3 arg constructor. Physically there should be only one object that is ‘obj’, then what about rest? I’m suspecting all rest of the objects are created in heap and it does not have references, so those objects are abandon objects (garbage will clean these objects).